Official Fallout 4 Christmas Sweater | Nerd Much? With the Fallout 4 release being just around the corner, the thirst is at an unprecedented level. We’ve seen some great merchandising so far, including the Pip Boy, some Funko Pop figures, and an official art book. 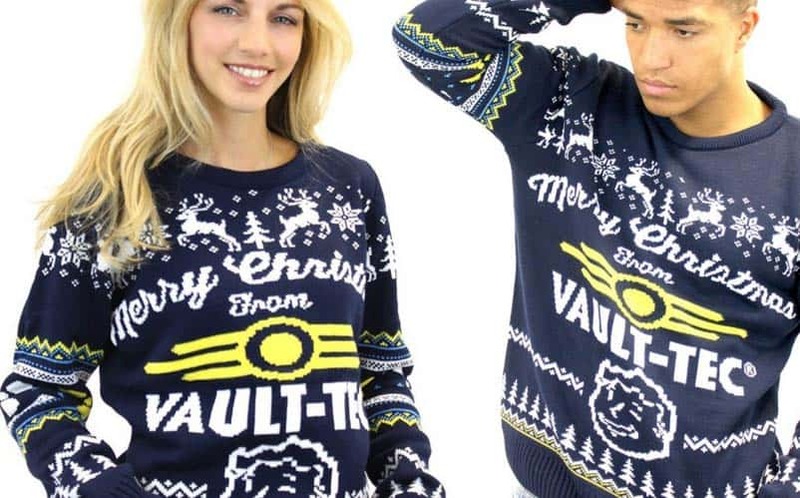 Now, Bethesda and Numskull are taking it one step further with a Fallout 4 Christmas sweater. We all love nerdy Christmas sweaters, but this one definitely takes the cake. It says “Merry Christmas from Vault-Tec” on the front, with reindeer prancing about the top of the sweater, and Christmas trees along the bottom. Whether you’re a ghoul, a raider, or just a good vault-dwelling citizen, you’ll certainly look cool this nuclear winter. This might be the greatest sweater we’ve ever seen, and we’re going to add it to our list of the best nerd gifts of 2015. If you think we’re wearing anything else to the midnight release, you’ve got another thing coming.